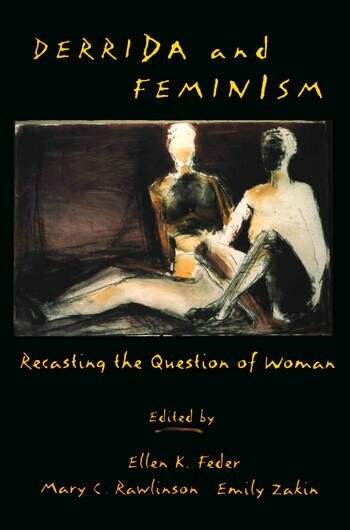 The first-ever compilation of articles that highlights the intersection of Derridean and feminist theories--a work that represents the extensive and diverse response feminist theorists have had to Derrida, particularly to the issues of gender, identity, and the construction of the subject. Introduction -- Ellen K. Feder, Mary C. Rawlinson, and Emily Zakin; 1. Jane Gallop -- "Women" in Spurs and Nineties Feminism; 2. Ellen K. Feder and Emily Zakin -- Flirting with the Truth: Derrida's Discourse with 'Woman' and Wenches; 3. Kelly Oliver -- The Maternal Operation: Circumscribing the Alliance; 4. Mary C. Rawlinson--Levers, Signatures, and Secrets: Derrida's Use of Woman; 5. Tina Chanter -- On Not Reading Derrida's Texts: Mistaking Hermeneutics, Misreading Sexual Difference, and Neutralizing Narration; 6. Ewa Plonowska Ziarek -- From Euthanasia to the Other of Reason: Performativity and the Deconstruction of Sexual Difference; 7. John D. Caputo -- Dreaming of the Innumerable: Derrida, Drucilla Cornell, and the Dance of Gender; 8. Drucilla Cornell -- Where Love Begins: Sexual Difference and the Limit of the Masculine Symbolic. Ellen K. Feder teaches in the Department of Philosophy at Vassar College. Mary C. Rawlinson is Associate Professor of Philosophy at SUNY, Stony Brook. Emily Zakin teaches in the Department of Philosophy at Miami University.